The FMA Group oversee projects that help improvement the physical environment. In the past, businesses have approached the former Greater Yarmouth Tourist Authority to see if they could help support a project to improve certain areas. Funds held by the GYTA (based on voluntary subscriptions) were usually never large enough to contribute to projects that involve groundworks or landscapes. Through the GYTABIA there are now opportunities to support projects of this nature. 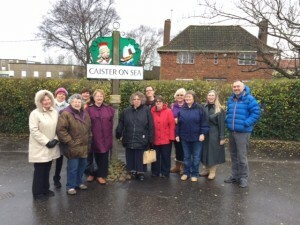 Restoration of the Caister Village Sign – the sign was originally installed in 1971 by the womens Institute and th paintwork and support pole were in a weathered state. Through funding it has been restored to it’s original state using traditional materials. Filby in Bloom – Support for the Filby in Bloom voluntary team to provide all year round colour and environmental responsibility for the Filby area. Access Gateways – To install decorative landmark creations on key roundabouts to the Borough – this project is ongoing throughout the period of the BID. ‘Park & Save’ Car Park Charges Offset Scheme – The existing car parking tickets were used to promote discounts to local attractions, restaurants and shops. The ticket was valid for 48 hours which will enabled visitors to use their tickets at participating businesses throughout the Borough. Great Yarmouth Town Centre & Seafront CCTV – Support funding for the ongoing monitoring, maintenance and transmission of the CCTV which includes 33 cameras in the area. Gorleston Community Heritage Tearoom – Love Flo’s@Ivy Lodge. To convert Ivy Lodge into a functioning heritage tearoom offering work experience placements to young adults with learning disabilities. Hemsby & Newport Replica Flower Display – Provided a quality all year round flower display in Hemsby & Newport without the need for watering to improve the local environment. Winterton Tourism – Investment in the creation of between 5-7 Winterton based walks using branded maps of varying lengths to improve the tourism offer in Winterton. Hemsby & Newport has more visitor beds than Brighton and represents one of the highest concentration of self-catering visitor accommodation in Europe. National Award winning Filby in Bloom is one of the wonders of the Borough and a magnet for 1000s of visitors a year. It has become an attraction in its own right. GYTABIA is keen to help with Filby in Bloom’s continued success. This provides a welcome for inbound passengers with information and advice about the area and its attractions. The service is staffed by volunteers who are all trained to the Olympic ‘Gamesmakers’ standards in customer service. Hanging baskets are aimed to make Gorleston High Street a nicer environment in which to shop and trade thereby encouraging increased footfall to the area. The overarching goal is to get the currently derelict Ivy Lodge in Priory Gardens transformed into a functioning Heritage tearoom and offer work experience placements to young adults with learning disabilities. On the 2nd May one of GYTABIAs early projects – new decorative lighting for the seafront in Great Yarmouth – was officially switched on by Her Worship the Mayor of the Borough of Great Yarmouth. The switch-on was also marked by the first fireworks display of the season.